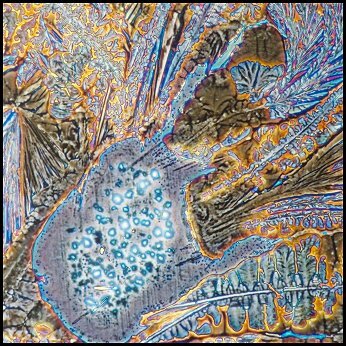 For many years I have photographed microscopic crystals using polarized light. 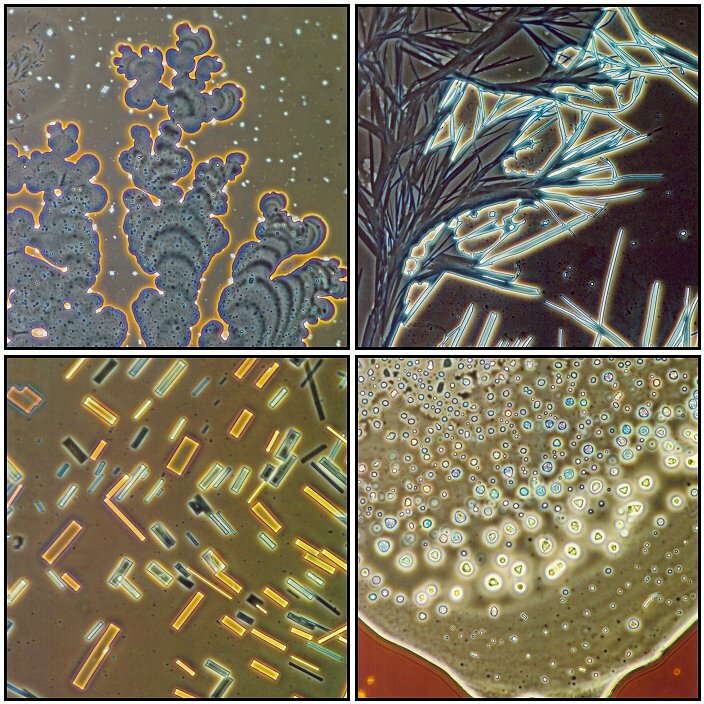 Recently, however, I obtained a phase contrast condenser for my Leitz microscope and decided to experiment with this type of illumination on previously prepared slides. My negative expectations were for the most part realized. Uniform grey vistas greeted me at almost every turn. Several slides however, seemed to be the exception to the rule and I decided to document my results. 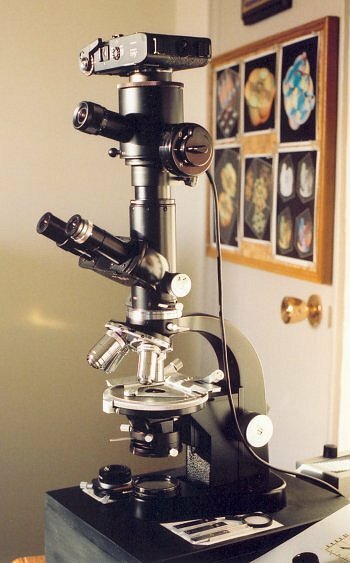 The photomicrographs in this article were all taken using the Leitz SM-Pol microscope shown here but with the polarizing condenser being replaced with the phase contrast unit. The polarizing analyzer was flipped out of the optical path in order to ensure that the only illumination was phase contrast. A Leitz NPL Fluotar 25/0.55 PHACO 2 objective and Periplan GF 10x eyepiece were used to form the original images. Kodak Max 400 print film captured the images and a scanner was then used to digitize them for inclusion here. All of the slides were prepared by placing a very small amount of the organic substance on a blank slide and covering with a cover glass. The slide was then held above an alcohol lamp and gently heated until the compound melted and formed a thin layer between slide and cover glass. Fingernail polish was used to ring the cover glass and provide a more permanent result. One of the slides photographed for this article is shown below. The best results were produced by five relatively low melting point organic compounds. 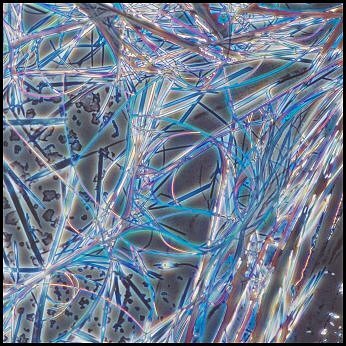 The first, maleic acid, is used as a mordant in dyeing textiles and in the production of other organic chemicals such as tartaric and malic acid. Urea is used as a nitrogen release fertilizer and was the first organic compound to be synthesized in the laboratory. n-butyl-p-aminobenzoate is used as an intermediate in the manufacture of organic compounds and as an UV-blocking ingredient in sun tan cosmetics. The major use of salicylic acid is in the preparation of its ester derivatives. Some of these esters are used in food flavorings and antiseptics. 1-nitroso-2-naphthol is used in analytical chemistry when testing for cobalt. In most cases, the phase contrast illumination worked best near the edges of the crystal field or near bubbles which formed by chance during the solidification process. 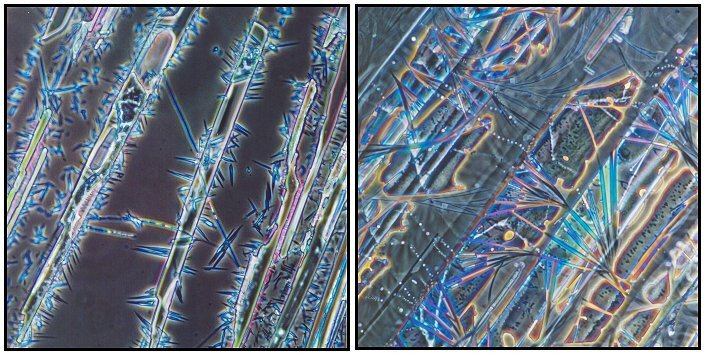 In those slides that produced interesting results, the exact same field viewed with polarized light was a disappointment. The success rate with this technique is extremely low. 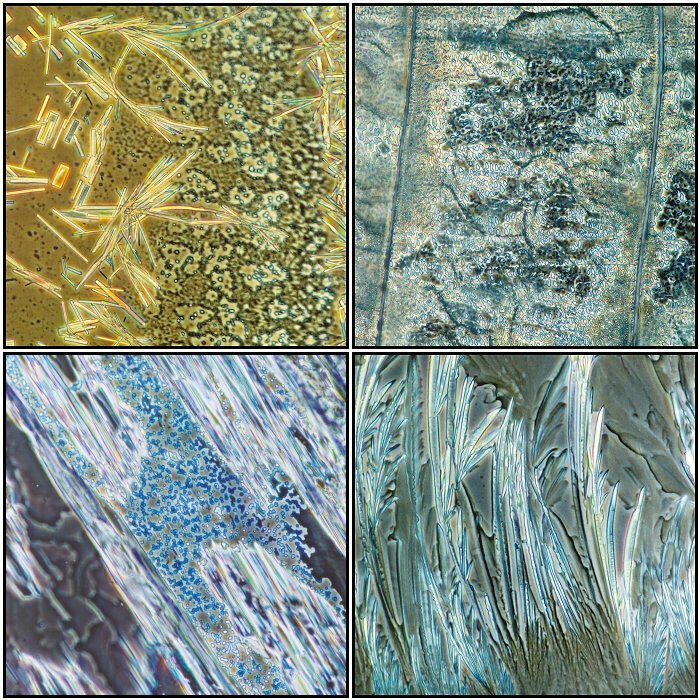 If you already have some crystal slides prepared for polarized light, it might be worthwhile to have a look using phase contrast. You might be surprised. I certainly was! Published in the April 2003 edition of Micscape Magazine.